Atomic's Smoke Ti is a frontside carver that makes shop owners and skiers happy alike—it sells well, and it delivers a lot of ski for the money. 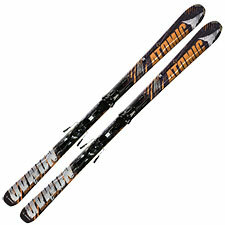 Probably Atomic wouldn't exactly push this as an economy-class ski, but you can't help noticing that the Smoke Ti trades at a noticeable discount compared to everything else in its class. Is this an elite-level carver? No, but I'll say again you're getting a lot of ski for the money here, with a performance profile that will appeal to a wide range of riders. The Smoke Ti features Atomic's 'adaptive' camber profile (also found on the pricier Crimson Ti), which varies the amount of tip rocker depending on whether the ski is flat or on edge. In practice the effect is very similar to the 2nd-generation early-rise tip found on Rossignol's Pursuit series skis, with perhaps a bit more pronounced edge grip. Atomic calls this an All-Mountain class ski, for skiers who don't want to spend all day on groomed slopes, but by modern standards this falls into the pure carver category, with a narrow 77-millimeter waist that isn't going to compete with wider skis on soft snow and crud. On-snow, the Smoke Ti immediately feels like an Atomic, with that classic combination of dampness and edge grip that is Atomic's hallmark. At my body weight the Smoke Ti feels a tad 'big'—I was skiing a 171cm version, but even at that length the ski gives an impression of size underfoot rather than quickness, despite its 15-meter turn radius. I do think the Smoke Ti has a better feel overall than the Crimson Ti. It is livelier, though as with all Atomics, it seems, the ski comes alive with speed and becomes sluggish as you slow down. Who should try the Smoke Ti? Definitely the ski will appeal to skiers emerging from the intermediate category and looking for a ski that will take them to the next level. Once again, because of price, the Smoke is almost the perfect ski for this class of rider. I say 'almost' because some newer skis in the frontside category do offer better performance (Rossi's Pursuit line, again), albeit at considerably higher cost. Overall, if you're interested in a carving ski and you aren't specifically demanding expert-level chops, the Smoke Ti remains a fairly compelling package. You can buy this with confidence knowing you're getting a great deal on a ski that will certainly not hold you back in your development. At some point along the advanced-to-expert spectrum, you will outgrow this ski, but, as they say, you've got to get there first.